I always like to talk with pride, why our customers are very loyal to Solix. It’s one thing to talk about our technology and high customer satisfaction, it’s another to hear it directly from customers. •	Richard Ilnicki, UK Team Leader, Santander Group. All three were targeting the same problem, retire legacy applications and reduce costs while meeting the compliance regulations: They needed to retire multiple obsolescent applications and aging hardware, while maintaining access to the data, including reports. Santander had to meet stringent compliance requirements including an absolute guarantee that the data was completely unchanged by the retirement. And it had the largest number of potential retirements because it grows mainly by acquisition. Every independent bank it buys runs on its own infrastructure, which has to be integrated into Santander’s IT environment, which always includes retiring non-standard applications. All three needed a solution that is independent of applications, operating system, and database platform. They needed a solution that is proven and scalable for all their applications. All three started by researching the field, including talking with Gartner and other industry analysts and looked at several possible solutions including build vs buy. Mr. Ilnicki in particular said his team at Santander looked closely at a large field of vendors, analyzing the costs and other business factors involved in each before arriving at a final list. One of the largest challenges in any technology change is selling it to the end-users, who generally do not like changes in how they are used to working. Each of the panelists, however reported that the move went very smoothly. Solix sold itself both to the IT staff and to the business users. Today all three customers have finished their initial retirements, which in two cases involved multiple applications and at Avery Dennison involved the retirement of its financial system. 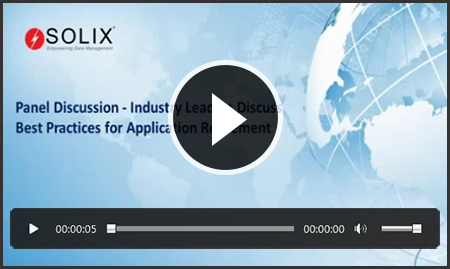 All are continuing to use Solix solution for their ongoing application retirement. If you are looking for either Data Archiving or an Application retirement solution, to clean aging, seldom-accessed data from operational databases, to improve performance, cut costs, and possibly support a move from spinning disk to flash storage, I urge you to watch the recording of this panel and learn why our customers believe Solix is the best solution.